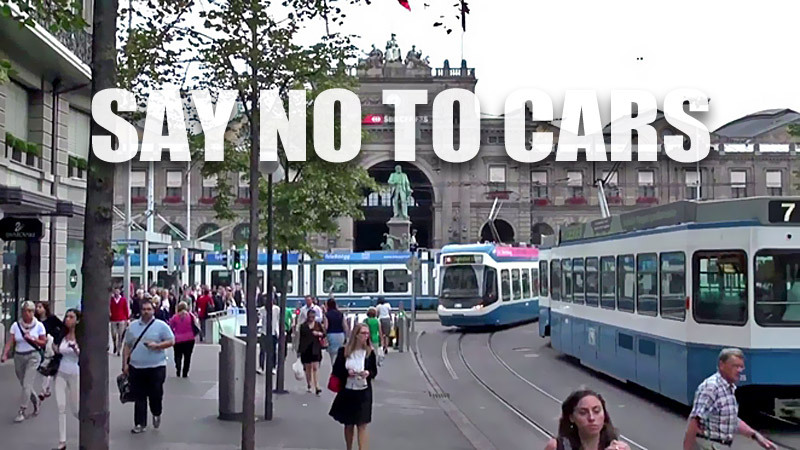 Zurich wants tourists to know that they’re welcome to the beautiful, historic city. They’re welcome to walk its streets, bicycle through its lanes, and enjoy its excellent, state-of-the-art public transportation system while they visit the city’s shops and restaurants. They’re welcome to do just about anything, in fact … except bring their cars. Like Amsterdam, Zurich has become something of a leader in urban planning, bike advocacy, and walkability- and it did so way back in the 1990s by taking the radical step of freezing the total number of parking spaces in the city, even as the population grew. As a result, more and more of Zurich’s residents and visitors were encouraged to take part in more environment- and community!- friendly modes of transportation. You can find out more about Zurich’s transportation nirvana below, in a video and summary presented by StreetFilms. Enjoy! When it comes to transportation options and smart city planning, you can argue Zurich, Switzerland takes the top prize in the world. The city has deployed a number of polices and practices that make commuting, living and working in Zurich a pleasant experience whichever mode (or modes) of travel you use. For one, back in the mid-1990s, via a city decree referred to as “The Great Compromise”, Zurich decided it keep their number of parking spaces fixed at current levels. So on the rare occasion they need to justify building new parking spaces, they must find other areas within the city limits to eliminate parking. And as a bonus: many of the new spaces come in the form of underground garages, which allows for more car-free streets, plazas and shared space solutions. Secondly, Zurich has a very intricate series of over 4500 sensors throughout the city designed to monitor the number of cars entering its limits. When that number exceeds the level Zurich’s streets can comfortably accommodate, all cars are halted on highways and main roads in to the city until congestion is relieved. Thus, traffic continually flows with little or no back-up in the city. When it comes to mass transit options, Zurich has a network of comfortable commuter trains, buses, and the magnificent gem of the city: its 15 line tram system. Trams run everywhere frequently and are easy to hop on and off. The coordination of the lines is a wonder to behold as trams pull into circular hubs from all directions. It is an on-going dance of commuters: a synchronicity of transit. And it’s the preferred way to travel in the city center. Business men in suits traveling to the richest banks in the world ride next to moms and skateboarders. That’s only the beginning of some of the great things going on in Zurich. We haven’t even touched on the bike mode share (6% and climbing) the amazing parks and rivers that have been cleaned up and filled with people socializing after work. The wonderful car-free/light pathways are filled with restaurants and tourists all times of the day. At least if you can never get to Zurich, you’ll be able to experience a bit of what it is like via our Streetfilm. Source | Images: StreetFilms, via Treehugger.